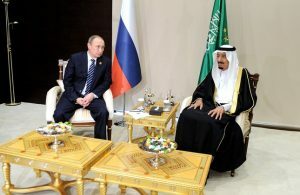 Saudi Arabia and Russia are on the verge of setting up a joint fund worth $1bn aiming at strengthening energy cooperation between the two giant oil producers. The deal is to be officially unveiled this week during the historical visit of King Salman to Moscow. This visit will enable both economic partners to strengthen cooperation in oil, gas, electricity renewable energy and other projects for oil and gas equipment, said Alexander Novak, the Russian energy minister in an interview with Saudi media Al Arabiya TV on Monday. King Salman will travel to Moscow Thursday, a trip marking the first visit of a Saudi reigning monarch to Russia. Novak also noted that both countries are also working on other agreements including the possibility for Russian firms to provide drilling services in the Saudi Arabia and crude oil trading between Saudi Aramco and Russian Rosneft. The Russian official also let it that Saudi partners were considering joining Russia’s Novatek in producing gas in Russia. Novatek is scheduled to enter into a deal with Saudi Arabia on a liquefied natural gas (LNG) project, known as Arctic LNG-2. The project is the second for the Russian company. Russia and the Gulf country have contributed significantly to maintaining stable the price of a barrel of crude oil. The barrel now trades around $50 and $60; half lower than its price in mid-2014, before the global crash. Written by: KanelkaTagba on October 3, 2017. Posted by KanelkaTagba on Oct 3 2017. Filed under Energy, Headlines. You can follow any responses to this entry through the RSS 2.0. Both comments and pings are currently closed.